HMS Laleston was still something of an enigma to me when I joined her at HMS Vernon at short notice in early 1973. People could tell me little about her apart from the fact that she must be a wooden minesweeper because her named ended with ‘Ton’. Try applying that logic to the likes of Middleton, Dulverton, Southampton, or Grafton today! In the event, I discovered that her name was pronounced “LA-LE-STON” (not “LAYLE-STON” as my previous captain would have me believe) but she was affectionately known to her ship’s company as 'LOLLIPOP' (In the usual sailor's way, LALESTON was contracted to 'LALLY' which somehow became 'LOLLY' or 'LOLLIPOP' as in Shirley Temple's "good ship"). 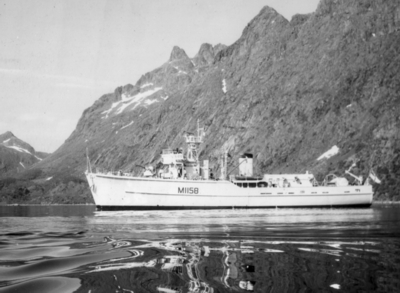 Mirrlees-powered, she still had an open bridge and her sweep gear had been removed to make way for a divers’ classroom/changing room and a two-compartment compression chamber on the sweepdeck. She had relieved HMS Miner III in March 1967 as a tender to HMS Vernon to provide open water diving training away from base. 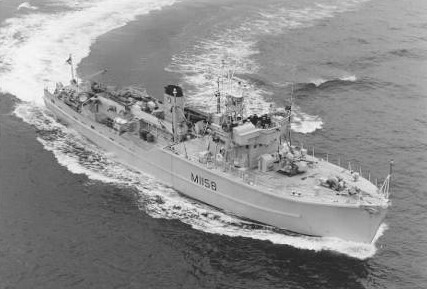 However, she had a secondary role as the legacy despatch boat for the Commander-in-Chief Naval Home Command (an appointment formed by the merger of the Commander-in-Chief Portsmouth and the Commander-in-Chief Plymouth on 1 July 1969) for which she was fitted with a specially reinforced derrick and crutches on the starboard side to accommodate his barge. We never actually embarked CINCNAVHOME during my time in her but the connection was always a useful card to play when we wanted special consideration from other authorities such as the dockyard during refit. Laleston spent most of her time day-running with diving courses embarked. She would sail in the morning and find a sheltered area with the required depth where she would anchor while diving training took place. She would also anchor at night a couple of times each week to act as a target for attack swimming, or as a diving training platform. During the winter, she operated from Tarbert Loch Fyne or Oban where a lee could always be found with suitable depths of water. In the summer when the weather was more reliable, she operated from Falmouth. The diving courses and their instructors were accommodated ashore and had no use for the ship at weekends when they conducted harbour diving and maintained their equipment. We were therefore left to our own devices. To provide some variety and ship training value, we would request approval to visit ports up and down the coast for particular weekends. I remember drafting the signal as Navigating Officer in 1974 asking Flag Officer Plymouth’s permission to pay visits to St Mary’s in the Scillies, Plymouth, Dartmouth and Salcombe on successive weekends. Back came the brief but entirely adequate one-word response, “APPROVED”. 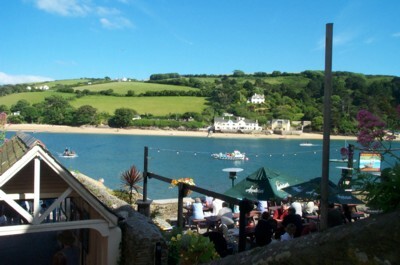 To give a flavour of those times, I will describe the Salcombe visit. I had suggested visiting Salcombe to my then Captain, Lt Cdr Hamish Loudon, because (1) it was within convenient range of Falmouth, (2) it provided a good navigational challenge, (3) it was rarely visited by anything larger than an Inshore, and (4) my granny ran a pub there! “Fine”, he said. Accordingly, I planned the passage, entry and exit and, as customary, left the charts together with a copy of the Pilot open at the relevant page on his bunk the day before sailing. The following morning, he summoned me to brief him on my plans. “Hmmm,” he said, “I see that at low water there’s not actually enough room for us to swing at anchor. In fact, we will almost be able to step ashore each side." As it transpired we arrived at Salcombe at slack high water and had little difficulty making our way safely to our anchor berth off Granny’s pub. The original intention was to let go aft and then run on before letting go forward and middling up. Unfortunately, there was a delay aft while the anchor and cable were slipped and the wire was veered which resulted in us becoming closely involved with a group of expensive powerboats moored at a trot. However, no damage was done to them or us and we ended up securely anchored fore and aft stemming the tidal stream. A boat routine was organised, the ship’s company was introduced to Granny’s pub and the officers mustered for a shore-side dinner in a restaurant owned by an ex-Navy friend. We waited for the Captain to appear from having gone to apologise to the manager of the local hotel for any anxiety caused by our earlier encounter with his powerboats. When he failed to appear, I went in search of him and found him ensconced with the hotel manager and a bottle of whisky surrounded by admirers. The wardroom subsequently dined without their Captain that evening. As is normally found in small out-of-the-way ports, it was a good run ashore. The Navigator’s Yeoman missed the last boat back to the ship on the first night but was put up in the Salcombe Hotel by a sympathetic manageress and given a five-star breakfast the next morning before returning to the ship by leave expiry. He so enjoyed the experience that he repeated it the next night! We attended church on Sunday and returned to the ship after lunch to await high water so that we could sail for Falmouth during the dogs. A light mist developed. Soon it became a heavier mist and then thick fog. The POREl appeared and reported that the radar had failed and was non-operational. We had to sail at that particular high water to ensure we were back in Falmouth the next morning to embark the diving course . . . and so we did. With the Harbourmaster on the bridge and his dory towing astern, we weighed and left Salcombe on echo-sounder and stopwatch, safely crossing the bar before disembarking our helpful pilot and heading west taking all precautions in reduced visibility. Twelve years later in 1986, I encountered the Harbourmaster’s son, Nigel Blazeby, serving as a Sub Lieutenant in a TON of the Third MCM Squadron at Rosyth. He left the Royal Navy as a Commander in 2001. Salcombe was only one of many UK harbours visited by Laleston in her time but, for me, it will remain among the most memorable. There are no private ships around these days but 'Lollipop' was certainly one of the last.